Description: American craftsmanship is combined with European artistry which results in Metro Swirl Handkerchief art glass. 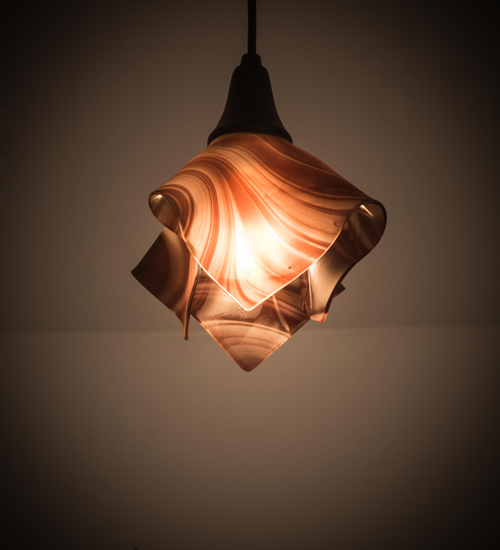 A cool decorative lighting design is achieved by kiln firing glass into a unique draped glass pendant. This Chambord Swirl, a Purple Baroque hued, handkerchief styled shade is complemented with Solid Brass hardware finished in a Black Powdercoat. Illuminate a table with this pendant or align the pendant in multiples across an island, bar, table or counter in residential and commercial settings. Custom styles, colors and sizes are available, as well as dimmable energy efficient lamping options such as LED. This pendant is UL and cUL listed for damp and dry locations.